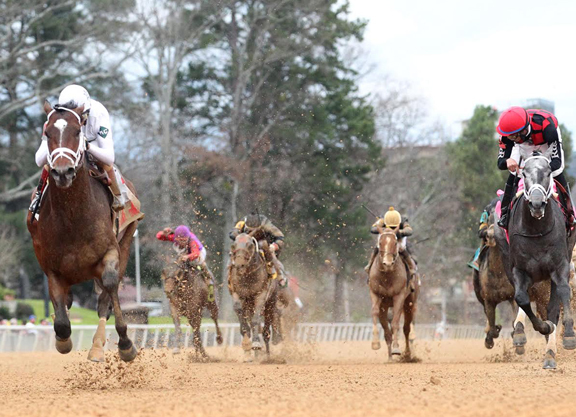 With his win, One Liner earned 10 points towards a spot in the starting gate for the GI Kentucky Derby May 6. 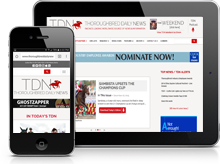 Maneuvered into an ideal spot racing in fourth behind loose-running ‘TDN Rising Star’ and post-time favorite Uncontested (Tiz Wonderful) through fractions of :22.93 and :46.55, One Liner began to gain some steam on the far turn and followed a move to the front by pace-stalking Petrov (Flatter). The bay was put to a drive as Petrov collared Uncontested, but found his best stride once straightened out for the drive and reeled in his gray rival to win going away by 3 1/2 lengths. Uncontested faded to finish sixth and Lookin At Lee (Lookin At Lucky) rallied belatedly to complete the trifecta. One Liner won his 5 1/2-furlong debut comfortably at Saratoga July 23 and went to the sidelines for an extended respite following that effort. He worked steadily prior to his comeback victory at Gulfstream last month and signaled his readiness for more with a bullet five-furlong drill in 1:00.80 at Pletcher’s winter Palm Beach Downs base Feb. 13. One Liner was sold by breeder Kingswood Farm for $150,000 as a Keeneland January short yearling. His second dam Cayala (Cherokee Run) is a half-sister to GI Donn H. winner Albertus Maximus (Albert the Great) and GI Champagne S. winner Daredevil (More Than Ready), who campaigned for Let’s Go Stable, WinStar and China Horse Club in 2014 and 2015 before beginning his stud career at WinStar in 2016. Cayala produced a colt by Into Mischief in 2016 and was bred back to Verrazano. SOUTHWEST S.-GIII, $500,000, OP, 2-20, 3yo, 1 1/16m, 1:41.85, ft.
Club & SF Racing LLC; B-Kingswood Farm (KY); T-Todd A. 3-3-0-0, $373,800. Click for eNicks report & 5-cross pedigree. B-Ray Hanson (KY); T-Steven M. Asmussen. $50,000.Margins: 3HF, 8 1/4, HF. Odds: 3.40, 8.50, 5.10. Also Ran: Silver Dust, Dilettante, Uncontested, Hence, P C Cowboy, Rowdy the Warrior, Chief Know It All, Warrior’s Club, Cu Rahy. Scratched: Cool Arrow.